Welcome to St. Anthony Catholic Church. 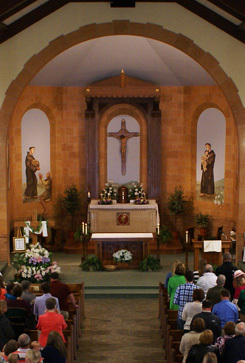 St. Anthony Catholic Church, located in Beckemeyer, Illinois has been extending the message of the Catholic Church since 1905. We hope that our website will provide information that will nurture and support your faith here in the parish & beyond. We encourage all of our parishioners to join fully in our life at St. Anthony by finding ways to contribute their time, talent and treasure through participating in worship, outreach, education, and social activities. We hope that our visitors find a warm welcome and information that expresses the spirit of our community. We invite you to come and be a part of our church community by attending mass or joining in the events of our parish. Together we are on a journey to grow in faith. We welcome your presence among us as we follow our vision to “continue to create a future together”.